Join us for a Women in Natural History Wikipedia Editing Workshop on 13 March! Have you ever wondered what it’s like to work in the world’s largest museum library? Now is your chance! 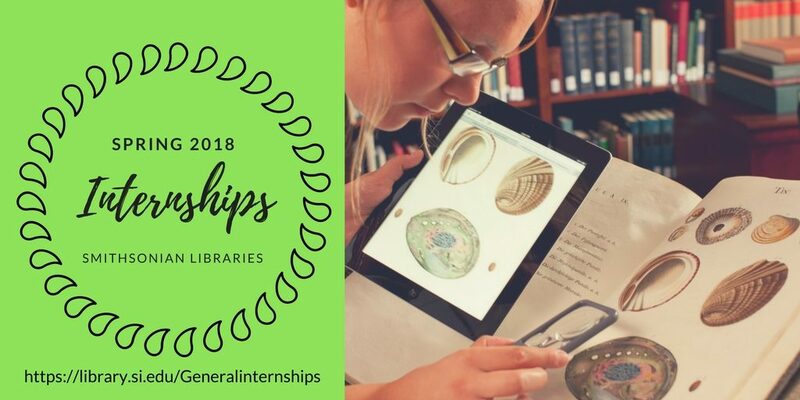 For Spring 2018, the Smithsonian Libraries will host internships in four diverse areas. Read below for more details and visit our Internship page for additional information and application instructions. The Smithsonian Institution Libraries artists’ files are an exceptional resource for art historical research. The Hirshhorn Museum and Sculpture Garden Library holds more than 41 file drawers on over 2,000 artists, art institutions, and collectors of modern and contemporary art. This project consists of learning how to evaluate the existing folder content for retention and deaccession; updating the physical housing of the collection to current archival standards; reorganizing and relabeling folder content; and reconciling collection holdings in the Smithsonian Libraries’ Art & Artist Files Database. The intern will also develop social media stories and blog posts to highlight the collection, the content of which could be thematic or focused on one or more objects or artists. Through this experience, the intern will learn or bolster collections management experience in the areas of preservation assessment, use of online resources to assess digitization need, effective use of electronic catalog records and databases to identify items, and how to collaborate across departments. The intern would research individual books and learn how to create Adopt-a-Book descriptive entries for the Smithsonian Libraries’ website. The intern will also work with the Libraries’ research guides, learning to develop research guides for the Web in a real-world situation and gain experience in developing a project plan to subdivide and better adapt research guides to user needs. In addition, the intern may have the opportunity to receive hands-on experience in other common areas of research library work, including shelving and Information Desk duty. This internship position will involve learning more about general library service assistance, particularly in the Botany and Horticulture Library, in addition to a major project. This internship will be part time, a maximum of two days a week and a maximum of two months. The intern will have the opportunity to receive hands-on experience in general library skills such as: accurately reshelving materials, handling circulation issues, and providing reference assistance to patrons (independently or under general supervision by the Branch Librarian). The major project will involve evaluating the library’s holdings of uncataloged opuscula scientific works. These are works where articles and monographs have been bound together based on author or subject matter or both (a common practice in the early twentieth century by scientists). The project will involve determining which items are duplicates and already in the collection and/or available online electronically. The ultimate goal is to figure out which ones are rare and valuable enough that they should be candidates for future original cataloging. In 2018, the Smithsonian Libraries will celebrate its 50th Anniversary with a variety of exciting outreach activities. The Social Media and Outreach Intern will be mentored by the Outreach Librarian and learn to produce social media content that is designed to support the Libraries’ outreach objectives. In addition, the intern will assist in organizing lectures and tours and learn to market library programs. The intern may also have the opportunity to create custom graphics and experiment with animated media such as GIFs and video for post content.